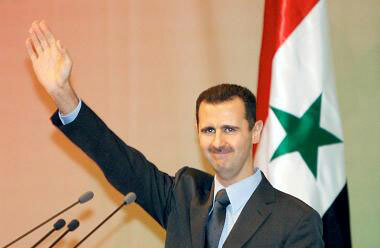 Syria’s Hope, Lt.Gen. 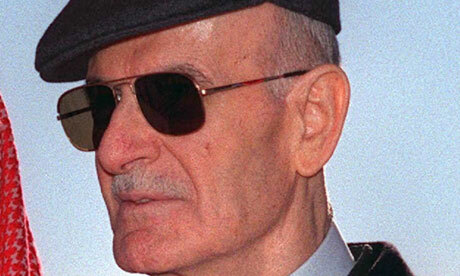 Bashar Hafez Al-Assad threw his hat into the ring of regional and international politics as to continue the march of construction and modernization initiated and closely watched over by his father, President Hafez Assad. The legacy of the late President would ever illuminate the path for Syrians and all the honest; hence, President Bashar Hafez Al-Assad’s inauguration speech came as a landmark strategy and mechanism of action at all levels and fields. H.E reiterated Syria’s ever cling to the realization of just and comprehensive peace on the related UNSC resolutions, the full return of the land to line of June4 1967 lines, calling on Mideast peace sponsor to actively and evenhandedly be engaged in the process and for more Arab solidarity, cooperation and coordination. As I stand today in this gracious Parliament all I can do is to start my address by thanking the Almighty God for granting us the strength in this resolute country and for providing us with the appropriate means that helped us bear the painful tragedy that has befallen all of us. I would also like to thank you all for the precious trust you have put in me and which you have expressed through your endorsement of what was contained in the letter from the Regional Leadership of the Baath Arab Socialist Party that included nominating me to the post of President of the Republic. I truly appreciate all the efforts you have exerted in your deliberations relating to the contents of this letter, these deliberations that revealed your high sense of responsibility and your abundant feeling of love for your country. From behind this podium I would like to express a very special thank to all our people, men and women, old and young, inside and outside Syria who bestowed upon me their trust through voting in the referendum and through their active participation in this national duty. I would also like to thank them for all the love and loyalty they expressed to me which had a great effect on me and granted me strength and optimism in the future. The result of the referendum is an expression of the will of the people and there is nothing I can do except to respond to the will of the people and to willingly accept to carry the mission I am asked to carry and shoulder the burdens and tasks related to fulfilling my duty during these very delicate and sensitive circumstances which our country, our nation and the world at large are going through at the moment. I shall try my very best to lead our country towards a future that fulfils the hopes and legitimate ambitions of our people. These tasks are both very difficult and very easy. These tasks are very easy because the great leader, Hafez al-Assad has prepared for us a firm ground, solid basis and a great heritage of values and principles which he defended and adhered to till he parted with us and moved to the after life. Added to this the infrastructure and the great achievements in all fields and throughout the country that will enable us to launch our work strongly and confidently towards a future we all desire. Yet, these tasks are difficult because the approach of the great leader, Hafez al-Assad, was a very special and unique approach and therefore it is not easy to emulate it especially as we remember that we are required not just to maintain it but to develop it as well. 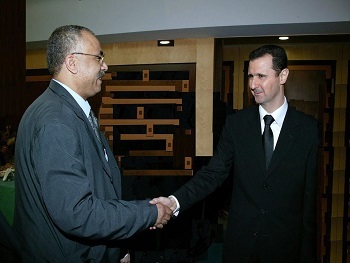 This undoubtedly requires great efforts and work at all levels with the aim of building on the basis of what has been achieved in the glorious period of Assad to continue with what has been achieved and to multiply the steps determined to overcome the difficulties and cope with the challenges without giving up our national principles ordained in our hearts and minds. In all this we have to imitate his wisdom by transforming sorrow to a creative energy and the painful event to continuous work and achievement. I said this yesterday and I reiterate it today that I am not after any post nor do I avoid any responsibility. The post is not an end but a means to achieve an end. And now, and since my people have honored me with their choice of me as president of the Republic and after I have been sworn in and assumed my responsibilities I would like to say that I have assumed the post but I have not occupied the position; the post has changed but the position remains unchanged since I was born and where the Almighty God wanted me to be and where our people desired me to stand since they have known that there is some one who truly loves his people and whose people truly love him and are loyal to him and where my parents and my family wanted me to be and in the place which I am determined to maintain and cherish to be strong by it and through it. This position that never changes is the position from which I serve my people and my country. The question now is what does this new post add to the position in which I have always found myself? I have always said to those I met with, that the post is a responsibility but the position has imposed this responsibility on me beforehand. Some might say that the post gives the legitimacy, but the legitimacy is first and foremost the will of the people and their desire. The importance of your vote on my nomination stems from the fact that it is a response to the desire of our people whom you represent in all their different strata. Hence, we can say that the responsibility is towards the interest of the people and the legitimacy is the people's will and their desire. The post is only the framework combines the two and regulates their relationship. Thus this post has added a huge burden to my position, a burden that consists of your love, trust, ambitions and hopes that I shall, with the will of God, be able to shoulder with your help and support. Every decent citizen has to put himself in a the position I have indicated above, shoulder his/her responsibility and to believe in legitimacy even if he were in situation that does not allow him to implement his ideas. The post does not engender responsibility, the opposite is true. The post deprives one of his responsibility and allows him to exercise it only through the authority granted to him. Whenever a person who has no sense of responsibility assumes a post he can take nothing out of it except power and power without a sense of responsibility is the source of chaos, carelessness and the destruction of institutions. The ideal state of affairs is that every one should feel responsible and this does not mean that every one should occupy a post. Posts are basic junctures in which the performance of society is continuously checked, inspected and energized in two directions: from top to bottom and from bottom to top. Thus, if anything went wrong at the bottom this will reflect at the performance of the top, and if any one at the toviolated the rule this will reflect negatively on the bottom. Thus society will not develop, improve or prosper if it were to depend only on one sect or one party or one group; rather, it has to depend on the work of all citizens in the entire society. That is why I find it absolutely necessary to call upon every single citizen to participate in the process of development and modernization if we are truly honest and serious in attaining the desired results in the very near future. As we are speaking about development, which I believe, is the major concern of every citizen in this country and in all fields, we have to know in which direction we are treading and what is the best way to take and what are the desired results. The answers to such questions constitute the compass that determines our current and future moves. In order to achieve what we aspire to achieve we have to move at three basic fronts at one and the same time: First: to suggest new ideas in all domains whether in order to solve our current problems and difficulties or in order to improve the current situation. Second: to renew old ideas which are no longer appropriate to our reality with the possibility of discarding outdated ideas which can neither be renewed nor could they be beneficial; rather they have become an obstacle in the way of our performance. Third: to improve old ideas and renew them in order to be suitable to the current and future purposes. Each work needs to be assessed in order to determine the percentage of progress and achievement in it. It is useful in this regard to adopt a set of measurers: The first measure is the time factor which we should use to the utmost extent in order to achieve what we aspire to achieve in the shortest time possible. The second measure is the nature of the situation in which we live and the different circumstances: internal and external, which surround us. The third measure is the potential we possess in order to start our pursuit to reach the designated objective, taking into account that the potentials are not fixed givens but they are susceptible to modification and change through our efforts and effectiveness. The fourth measure is the public interest at which all previous measures meet and through which all of them should be determined. This is a measure and an objective at one and the same time. What is the value of any work we do if it is not navigated by public interest? But in order to make the required move, and with confidence that we shall succeed, we have to have a certain set of means the most important among which are: The creative mind that cannot be stopped at any limit and does not confine itself to any fixed framework. Today and tomorrow we are in desperate need to creative minds in order to push the development process forward. Some people may believe that creative minds are linked to age and that they can frequently be found with the youth but this is not quite accurate. Some people of a young age have strong minds and some elderly people may depart this life with minds that are still so lively and creative. We are also in desperate need to constructive criticism which is the exact opposite of destructive criticism that often colors most discussions and proposals for various reasons whether they are personal or otherwise. In order to be constructive in our criticism we have to be objective in our thinking. Objectivity dictates that we should view each topic from more than one perspective and under more than one circumstance. Hence, we analyze it in more than one way and then we may reach more than one possibility, or at least the best possibility or the closest to the truth. We have to stop ushering criticism with the objective of beseeching people or of inviting people to clap hands for us or with the aim of provocation or malice. This is a waste of energy and time that we can well do without. When we say constructive criticism and an objective opinion this will necessarily mean to view the topics under criticism in a complete and comprehensive fashion in a way that enables us to see the positive points as well as the negative ones. In this way we will be able to increase the positive points at the expense of the negative ones and this is the only way to development. As we are speaking about instruments we cannot afford to ignore the issue of accountability which is a complete and inseparable process that starts with the basic and the smallest unit in society which is the citizen and it ends up with institutions. Each citizen has to ask himself and watch it and review his daily work, otherwise this accountability will not fulfill its objectives. Here, one's conscience plays an important role and the necessity to purify it form all misgivings that cause its impurity due to certain circumstances and different factors that may surround each individual. As for the other levels of accountability which are carried out by specialized institutions, they relate to the cases in which there was an abuse of rules and regulations, the cases which should be very few if personal accountability is properly exercised. In this case the performance of institutions would be better and healthier. This is a continuous process that should be in parallel to the work or should form a part of it. Mistakes in their various forms are part of life and if they are not duly addressed they will be aggravated. Correcting mistakes, however, should never aim to revenge; rather it should be meant as a deterrent for others and not just for the one who committed the mistake but for all those who might think of committing similar mistakes. In such a way we will be able to put a common strategy for development that will constitute a specific framework for steps and measures which should be taken in order to achieve the objectives of such a strategy, especially as our country has undergone different historic, political, economic and social circumstances during the twentieth century, circumstances that were and still are changing rapidly. These changes were mostly political. 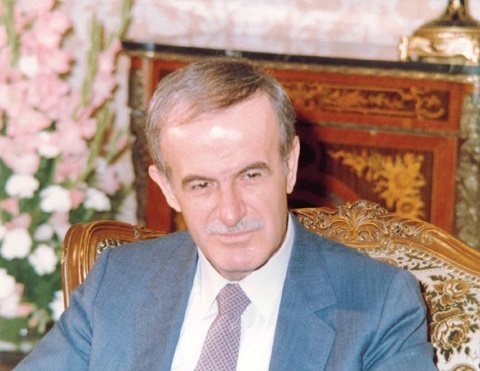 President Hafez al-Assad was able during the last three decades to put a general strategy that responded to the various needs of desired development; a strategy that covered different sectors. The political strategy which he put and supervised both its implementation and development proved a great success until this very day. As for the other domains, as we all know, they did not cope with the excellent political performance for many reasons. That is why there was a definite gap between the political performance and the performance and all other sectors. If the performance of other sectors were better our political stand would have been stronger no doubt, though it is solid enough, but our ambis always to add to what we have. The performance in the economic field, in particular, went through sharp fluctuations as a result of changing circumstances that in turn were the subject of sharp changes, particularly as our economy moved from an economy that has open markets to an economy that has to be competitive. This point was addressed through issuing laws and decrees which were sometimes experimental, sometimes impulsive and at other times they were a reaction to a certain state of affairs. Very rarely this point was addressed in an effective way that takes the initiative which precedes event. The reason for this was that there was no clear strategy that aimed to bring about certain legislation; rather the economic strategy came as a result of all these legislations. Hence, it came out weak with many loopholes and it was partially to blame for many of the difficulties from which we suffer today. This means that today we need economic, social and scientific strategies that may serve both development and steadfastness in the meantime. Such strategies are not available as ready recipes; rather they need deepened studies the results of which can be considered the basis that decides our point of direction. This undoubtedly needs time, effort, cooperation as well as extensive and broad dialogues. The question that we have to ask here is, shall we wait to finish putting the required strategies in order to start the process of development or do we continue to improve what we have started in the past? It seems to us that the work should start in parallel through a follow up of taking the required measures in addition to preparing visions in order to draw our future plans knowing full well that fragmented development does not achieve our desired objectives. Hence there is a need for coordination and complimentary orientation among measures and steps taken in all fields. All what has been indicated above needs analysis and analysis needs studies and results which in turn need a reality to be based on. When we say reality' it means accurate figures. Figures do not lie and therefore they are genuine and transparent. Dealing with figures requires honesty and transparency. The term transparency' has been frequently used and discussed lately in dialogues and essays and in other places as well. Some used to call for a transparent economy and others called for transparent media while some others called for a transparent mentality in other domains. There's no doubt that transparency is an important thing and I support such an endeavour but through a proper understanding of the content of the idiom and of the ground on which it might be based. Prior to being an economic or a political or an administrative case, transparency is a state of culture, values and social habits. This poses a question and a requirement in the meantime that we should ask ourselves before we address it to others; am I transparent with myself first and with my family second and with the close and distant circle and with my country third? Any one whose answer is in the affirmative will undoubtedly know the meaning transparency and will be able to appreciate its horizons and to practice it wherever he/she might find himself herself. How do we, for example, ask a person who is not honest in his personal life and with those closest to him to be an honest official towards his responsibility and towards his people? If he is a vague man in his arguments how do we ask him to be transparent when he assumes a certain post? If we want to address a problem we should start at the beginning and not at the end and we should address the cause rather than the result. This dictates that we should face ourselves and our society bravely and conduct a brave dialogue with both in which we reveal our points of weakness and talks about customs, traditions and concepts which have become a true impediment in the way of any progress. Society is the path on which all progress in different domains must tread. If this path is not good, development will flounder or stop, which in a relative sense means going backwards. This is one of the difficulties in our reality and the analysis of this reality requires concentration on the obstacles which keep this reality as it is without any true improvement. This needs an active participation by all parties concerned, outside the framework of the State and inside it so that all groups and social strata may contribute to finding the appropriate solutions. I would like to stress here that any one who figures out a problem should also indicate the solution for it. We have to shake off the attitude of evading the sense of responsibility. We have to give up reliance on others. The employee relies on his colleague and the junior employee relies on his senior and the citizen considers the State responsible finding for solutions. I would like to reiterate here that finding solutions is the responsibility of all of us in order to make these solutions complete and effective. You should not rely solely on the State nor should you let the State rely solely on you: let us work together as one team. I would like here to give an example from our economic life which is the case of export that is considered an important pillar in the national economic income and which will receive a very special attention during the coming period. It is the duty of the State to issue legislations and laws and to make decisions and sign agreements with other countries and parties in order to encourage export and to help find markets in addition to achieving the capacity to be competitive, but this will not be completed properly if the Syrian goods do not enjoy a good reputation and if they are not of high quality and standards. Added to this the fact that both producers and exporters should be accurate and should respect the date of delivery in addition to conducting marketing operations for their goods and effectively participating in domestic and external exhibits in order to broaden their markets, the fact that will achieve prosperity both for them and for national economy. In this regard it has become necessary to move in steady, though gradual, steps, towards performing economic changes through the modernization of laws, the erosion of bureaucratic obstacles standing in the way of internal and external investment flow, the recruitment of both private and public capital, and the activation of the private sector and granting it better opportunities to work. It is also necessary to bring the public sector to a competitive level in both domestic and external markets, the thing that leads to a balanced and comprehensive development in all provinces of the country and in rural as well as urban areas. This will also lead to a fair distribution NGP in a balanced fashion, to the increase of job opportunities and to the improvement of the livelihood of citizens in the light of the increase of their lively needs and the constant increase in the cost of living. 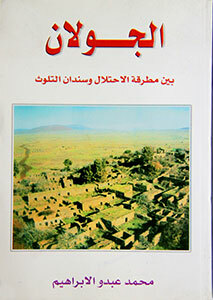 The agricultural public sector should also be developed through the modernization of its means of production and through the search for markets to sell its products as well as through enhancing land reform and dispensing with negligence and passivity which took place in the past and to speed up the building of dams that serve our developmental plans. We have also to put a wise economic policy that bridges gaps between sources and expenditure, between export and the rehabilitation of the private and public economic sectors to face the increasing dangers resulting from the challenges of globalization. In this way our economy may well assume a respectable place in regional and international economic blocs. Our aspirations will not be properly fulfilled unless we emphasize the role of institutions in our lives. An institution is neither a building nor a system that governs nor the persons who work in it; rather, it is first and foremost, the institutional thinking that considers every institution, however small it might be and whatever its domain may be, a representative of the entire country, its reputation and its civilized outlook. Institutional thinking acknowledges that institutional work is a joint and not a personal work, a work that is based on honesty, sincerity and on using time to the maximum extent, on putting public interest above personal interest, and on putting the mentality of a state above the mentality of the tribe. It is the logic of cooperation and openness to others, and it is inseparable from the democratic thinking which has many things in common with it in various places. This means that democratic thinking enforces and strengthens institutional thinking and work. To what extent are we democratic? And what are the indications that refer to the existence or non-existence of democracy? Is it in elections or in the free press or in the free speech or in other freedoms and rights? Democracy is not any of these because all these rights and others are not democracy, rather they are democratic practices and results of these practices which all depend on democratic thinking. This thinking is based on the principle of accepting the opinion of the other and this is certainly a two-way street. It means that what is a right for me is a right for others, but when the road becomes a one-way road it will become selfish. This means that we do not say I have the right to this or that; rather we should say that others have certain rights and if others enjoy this particular right I have the same right. This means that democracy is our duty towards others before it becomes a right for us. Democratic thinking is the building and the structure. We all know that when the foundation of a building is weak the building will be threatened to fall for the slightest reason. Hence, each building is designed in a way and has a foundation appropriate to the weight it is expected to carry. Hence, we cannot apply the democracy of others on ourselves. Western democracy, for example, is the outcome of a long history that resulted in customs and traditions which distinguish the current culture of Western societies. In order to apply what they have we have to live their history with all its social signification. As this is, obviously, impossible we have to have our democratic experience which is special to us, which stems from our history, culture, civilization and which is a response to the needs of our society and the requirements of our reality. In this case our experience will be strong and able to stand the test of time no matter how difficult that might be. Destructive experiences in different countries: close and to see and take lessons from. Our National Front is a democratic example that has been developing through our own experience and that has played a basic role in our political life and in our national unity. Today, it has become necessary to develop the method of the work of the National Front in a way that responds to the needs of development in our developing and changing reality at all levels. As the democratic and the institutional thinking are linked, and I am not saying identical, administration is bound to be influenced by them. Hence, administrative reform which we have to conduct in both the private and the public sectors is linked to them: it develops with their development and retraces with their retrace. Administrative reform is a pressing need for all of us today. Inefficient administration today is the greatest impediment in the way of our march towards a better development; it negatively affects all sectors without any exception. We have to start immediately to prepare the studies which ensure the change of this reality to the better through improving the administrative systems and their frameworks, through increasing the level of efficiency of the administrative and professional cadres and through putting an end to the state of carelessness, passiveness and evasion of carrying out one's duty. There is no escape from bringing the careless, the corrupt and the evil doers to justice. This also requires the improvement of the accountability apparatus in the country in order to make it more effective and to support it with the appropriate resources. Here comes the importance of the energized role of your Parliament in correcting the work of different institutions through pointing to the points of weakness and inefficiency and following up the process of correcting it in a positive way. I would also like to stress here the important role of the judicial system and the necessity to support it with the clean and efficient cadres so that it may play its full role in order to achieve justice and guard the freedoms of citizens and the proper implementation of laws. From what has preceded we can notice that the work of institutions is closely linked, the fact that requires also a close link between the mind that governs and organizes the work of each institution such as the institutional mentality, the democratic mentality and transparency that starts in the home and grows or recedes through the circumstances of daily life. Society is the fertile soil in which we sow our seeds; as for the fruits we reap in institutions. Hence, the better the seeds we sow the better and fresher the fruits we reap. The task of the state is to prepare the suitable and appropriate ground for the seeds to grow. It also has to provide the best circumstances for this growth and to guarantee that the fruits remain fresh (which is the most important stage) so that our soc may benefit from them; otherwise they will go off and become rotten and a source of illness and disease. We have to respect law because it guarantees the state's respect for the citizen and the citizen's respect for the state. The rule of law guarantees our freedom and the freedom of others. We have to fight waste and corruption taking into account that each kind of work will necessarily entail a percentage of unintentional mistakes which should not worry us but we should try not to allow their recurrence. We have to distance ourselves from chaos and wasting time and to commit ourselves truly and sincerely to our work and to double our efforts in order to make up for what has been lost. We have to give up the idea of uprooting the status quo in totality instead of working to develop and improve it basing our work on the view that human life has no ultimate truth. No matter how bad the reality might be it must carry within it some good things, and no matter how good or excellent it might appear it will not be pure from misgivings. The march of people is made up of successive achievements, each group of which is built on what has preceded it. Development comes as a result of building positive things on the good things that preceded them. As for backwardness it is the opposite of that. Hence, one can launch one's work from the positive points even of a bad reality to create a better reality and from the better one moves to what is best. While if we are to uproot everything in reality it means that we are eliminating it with all its negative and positive points, and then when a new launch is needed what is it to be based on: a vacuum or a point zero? We have also to get away from repeating concepts and idioms without any proper understanding of their contents. Many ideas may respond well to our needs but the lack of a proper understanding of these ideas may turn them into harmful concepts. We have to pay a very special attention to qualifying cadres and training them in all fields and at all levels through depending on national cadres both in Syria and out of it in addition to contacts with Arab and foreign cadres and through benefiting from countries which have successful experiences in various fields. We have to stress the importance of planning and the quality of this planning in order to reach a qualitative society and state and in order to continue the building of contemporary and progressive Syria. We also have to stress the importance of spreading education and knowledge and information technology as well as paying special attention to the trade of minds and to exporting ideas and developing scientific research through providing the infrastructure that starts with organized work through research institutions and ends up with the necessary technologies, according to the abilities and the necessity of linking this to the developmental needs of our society. Reform and improvement are certainly needed in our educational, cultural and information institutions in a way that serves our national interests and strengthens our genuine culture that leads in turn to undermine the mentality of isolationism and passivism and addresses the social phenomena that negatively affect the unity and safety of our society. The target of all what has been mentioned above is to prepare skilled and qualified social forces able to deal and interact with various world developments especially as our current reality constitutes a ground that is not quite apt to enter the new century which is the century of institution and information technology. It will be very difficult to achieve any of what has preceded if women were not active participants from their positions as they constitute a true half of our society. Women are the ones who bring up both men and women and who prepare them to participate in building their country. Women play an important role in progress and development in various places of work. The appropriate ground for women's participation should be well prepared so that they may become more effective in our society and more capable to play a role in its development. If we are able to commit ourselves to all what has been mentioned above we can rest assured that Syria will stay the master of itself, free to take its own decisions, taking into account that none of us has a magic solution to solve all the problems in one go. Hence, there is a need to put priorities and preferences remembering always that change is not an end in itself but a means to respond to our daily needs. Promises should not be cut unless one possesses all the elements that lead to the achievement of the required task. This could be possible at a personal level or in a certain domain or field but when we speak at the level of a country, especially when hopes are so great and difficulties are just as great, then no one person may possess all the right elements and no single post can provide them; rather these elements have to be found by the community, officials, institutions and citizens. What I can promise you now is that I shall work tirelessly. As for achievements we have to promise each other that each one of us shall offer what she/he has of elements and potential and abilities in order to reach our common objectives. Our strenuous efforts to foster our domestic front are strengthened through our relations with other countries especially our Arab brother countries at all levels, and through activating the existing Arab economic conventions and the continued efforts to establish a true nucleus for a joint Arab market. This is the minimum but the best possible thing now in order to maintain what is left of the hopes for establishing healthy Arab-Arab relations. The state of the Arab nation and the weak ties among Arab countries that have prevailed during the last few decades and especially during the nineties is no longer a secret to any one. Regional interests superseded the national ones; the Arab body was weakened and the Arab nation suffered from divisions among its countries. The Arab nation accommodated itself to this new abnormal situation, and what should have been a state of emergency became the normal state of affairs to the extent that any talk about Arab nationalism or Arab solidarity seems at least to some to be romantic or a waste of time. Some even started to shed doubt on Arab common interests. Despite this deteriorating state of relations among Arab countries which might prompt some to be pessimistic and others to be frustrated we should not surrender to the feeling of utter hopelessness to achieve any breakthrough in this regard. We should neither surrender to this current reality nor be satisfied with it. There has to be and healing initiatives that do not rely on the logic of gain and loss at the country level but at the national level. They should depend on the goal of collective gain that will make individual gain more certain. Such initiatives should also depend on the logic of national dignity and Arab values and ethics. In this regard we look forward to a more effective role played by the Arab League to achieve this particular goal. We, in Syria, shall stay as we have always been, supportive of any solidarity step that might serve the higher interest of the Arab nation, particularly steps that might lead to the consolidation of points of agreement among Arab countries in a way that undermines points of difference and division and paves the way for a reasonable level of productive relations among these countries at a first stage in order to prepare for a better future for these countries at later stages. We have to do that fast because the new international situation gives the position to the stronger party. This is the fact that prompted many countries to establish different regional alliances in order to be stronger in facing international challenges and to gain an extra margin in their manoeuvres. We who possess greater factors to establish a coherent unit are called upon more than any one else in the world to pursue such a project of regional unity. We consider our relationship with Lebanon an example of a relationship that should exist between two brotherly countries. But this example is not perfect yet and it still needs great efforts in order to be ideal and to achieve the joint interests of both countries in a way that responds to the ambitions of both countries. Nonetheless, the Syrian-Lebanese solidarity during the past few years has achieved a great deal which would have been impossible to achieve had each country worked on its own and in isolation of the other. Ending the civil war in Lebanon, establishing national reconciliation in addition to the defeat of the Israelis in the eighties and nineties and finally their worst defeat lately in the month of May are a clear evidence of the importance of this solidarity. Of course, all these achievements were based on the solidarity and unity of the Lebanese people and state with the heroic Lebanese national resistance. We, in Syria, shall always stand by Lebanon and support it in all its national causes, especially in matters which concern the return of its full territory and the return of its prisoners locked in Israeli jails and in its brave stand in the face of repeated Israeli threats to lead an aggression against it. Such threats do not serve the cause of peace in the region; rather they keep the points of tension hot, the fact that keeps the threat of the emergence of new circles of violence in the region possible as well as putting obstacles and impediments in the way of achieving a just and comprehensive peace in the region. 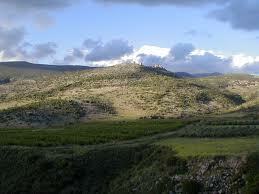 In this regard, Israel still occupies our Golan and this is a topic that preoccupies us. The liberation of our territory is at the top of our national priorities and is as important to us as the achievement of a just and comprehensive peace that we have adopted as our strategic choice, but not at the expense of our territory nor at the expense of our sovereignty. Our territory and our sovereignty are a matter of national dignity and no one at all is allowed to compromise any of them. We were very clear in dealing with peace issues, firm in our stands since the beginning of the peace process in Madrid in 1991; unlike the Israeli policy that fluctuated sometimes and put obstacles at other times. Until this very moment they did not give us any proof that invites confidence that they have a true and genuine desire to achieve peace. Rather they have been suggesting different versions in order to cover what they truly want to do so they ask us to be flexible and I think that they mean the territory should be flexible in order to press its borders and make it shrink in a way that suits their objectives or they send us missionaries who ask us to agree to a modified line of June 4 and ask us to call this modified line June 4, as if the difference is about naming the line. Or they suggest to give us 95% of our land and when we ask about the remaining 5% they say it is only a problem of few meters and this should not be an obstacle in the way of peace. If those few meters are not a problem and should not be an obstacle in the way of peace, then why they don't return to the June 4th lines and give us 5% of the territory west of the Lake? 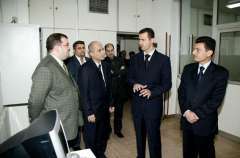 They have betted on many things; they have betted on the health of President al-Assad forgetting that national leaders who enter history enter it through the doors of their own countries and enter the world of eternity through the same door and never through concessions and giving up rights. They have betted on the military strength and were defeated in Lebanon. They have betted on our national unity and our people defeated this bet and now what are they going to bet on? The only betting that may succeed is to bet on the will of the people to return their rights through the return of their complete territories to the line of June 4, 1967. Only then we can proceed towards a just and comprehensive peace. We call upon the United States to play its full role as an honest broker and a cosponsor of the peace process. Pressure has to be exerted in order to implement the resolutions of international legitimacy with all the legitimate rights they dictate for the Lebanese, the Syrian and Palestinian people. We would like to stress here that we have the urge to reach a state of peace but we are not ready to give up an inch of our territory nor do we accept our sovereignty to be impinged upon. We would like to achieve peace because it is our strategic choice and because the Syrian people have always been, through history, peace lovers and because we would love to restore our beloved Golan complete and because we want its people to go back to their homes, but we are not ready to give up an inch of our territory nor to achieve peace at the expense of our national sovereignty. Our brave people on the Golan will always be today and tomorrow and for ever Arab Syrians because no matter how long it might take this land will always be ours and will be returned complete to us one day sooner or later. We are not prepared to pay the price of the helplessness of the Israeli governments and their inability to make decisions that push the peace process forward at the expense of our sovereignty and dignity. The ball of peace which they throw at different courts according to their whims is a heavy ball and carrying it needs statesmen who are able to make difficult decisions and not just people in offices who carry this ball with them wherever they might be and it moves around and they move with their political posts. The policy of adhering to the principles of international legitimacy requires the United Nations to carry out its mission as mentioned in its Charter in an objective way and away from different points of influence that might limit the implementation of these principles in the best way possible in order to reach a world with no conflicts and no points of tension, a world where peace, justice and democracy prevail among countries and in which dialogue is deepened and broadened among different civilizations in the world of today. In addition to this, the North rich countries should shoulder their human responsibilities towards the countries of the South with the aim of reaching a more secure, a more confident and as a result a more stable world. We look forward to building the strongest relations with the states, peoples and international organizations on the basis of mutual respect and constructive cooperation and the safeguarding of international peace and security basing our relations on the rights of people to self-determination in a way that secures their lively interest. As we are talking about every thing that concerns our people at the domestic as well as external fronts we should not forget that there are the unknown soldiers who do not exert efforts only but who pay with their souls without any price. They are the sons of our military forces, the guardians of our country, the source of our pride and the symbol of bravery and heroism who were and will remain to be ready to defend our country and support our brothers. Our military forces shall remain an example of honor, and perfect national and responsible behavior and shall always remain the focus of our great attention in order to remain able to carry out their duties whenever they are called upon. All our love and appreciation to the members of our glorious army and our high respect and loyalty to the innocent martyrs who fell in battles of honor and duty. I shall not forget to mention our brave people on the Golan who cling tenaciously to their country and their Arab nationality rejecting Zionist existence in all its forms and we say to them we are with you and our steadfastness together is the guarantee that our land will be liberated. In Lebanon, the brave national resistance wrote the best anthem of heroism and martyrdom and shall always remain in its path and achievement and example that will live long with future generations. Our dear people, My trust in you is infinite and so is my love to you. I hope you will allow me to emphasize to you a fact I feel that the man you have known and loved some of his merits and exchanged trust and love with him will not change at all once he assumes his post. He came out of the people and lived with them and shall remain one of them. You may expect to see him every where whether in the work place or on the streets or in your picnics in order to learn from you and sharpen his determination by his contact with you and shall work for you as he has always done. The man who has become a president is the same man who was a doctor and an officer and first and foremost is the citizen.